I don’t usually post “tips” but this issue has frustrated me to no end for many months and I finally found a simple but instant effective solution. It’s too good not to spread the word about. In the last couple of months, I started noticing that clicking the “Downloads” folders in Windows Explorer took around 15-20 seconds to load. This become quite annoying as I frequently access downloaded files from browsers. I tried deleting clearing out the folder but that didn’t have a lasting effect. After a bit of research, it turns out apparently Windows 7 (and Windows 8) tries to guess-timate what the contents of the folder are and assigns special “rules” to them to optimize the view settings and sorting. For some reason, the “Downloads” folder likes to be categorized as a “Pictures” folder (I’m guessing because people store a lot of JPGs in it). The problem with this view is that it tries to generate thumbnails for all the files in this folder, even if they’re not pictures. The fix is to ensure the folder settings for “Downloads” is optimized for “General items”. This should have an instant effect (the next time you add files to the folder since the thumbnails are otherwise cached anyway). 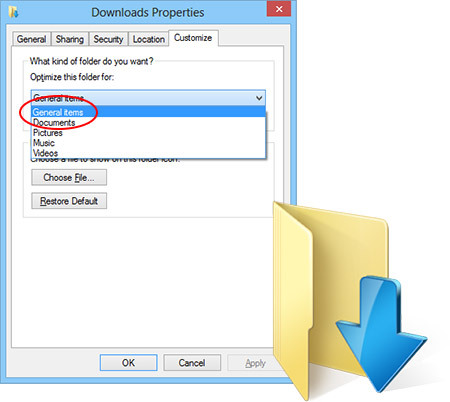 Unfortunately, this change doesn’t seem to always stick as Windows may change the option as you download more files, so you may have to check this setting once in a while.